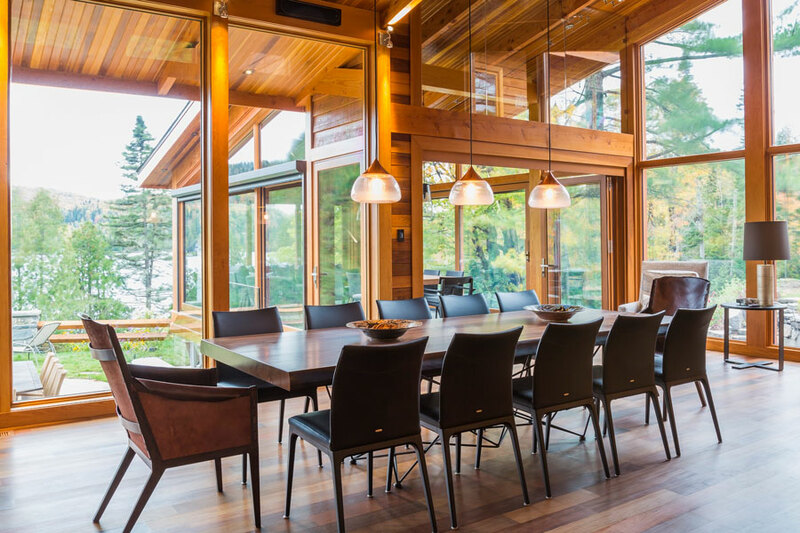 Red cedar, a fir timber frame and wall after wall of glass define a Canadian lakeside home that is as cutting edge as it is grounded in its rustic roots. 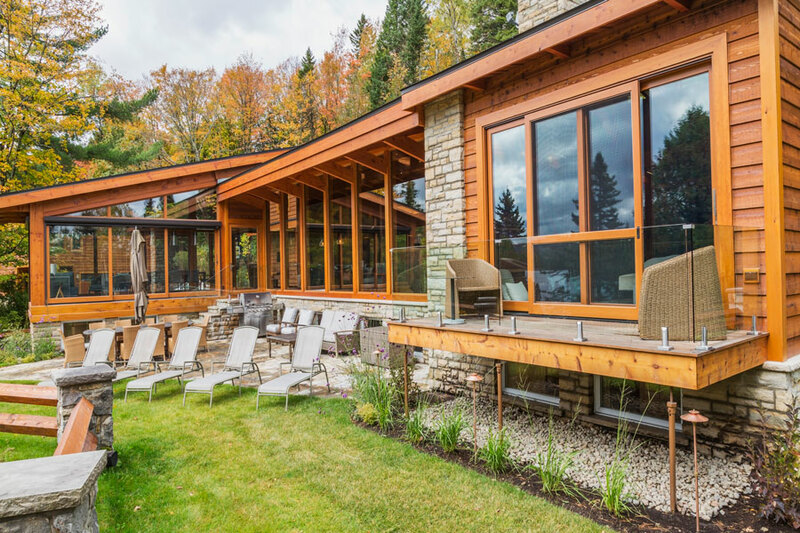 Light would be a most appropriate word to describe this superb red-cedar-and-timber-framed home that overlooks scenic Lac Manitou in the Laurentian Mountains of Quebec. 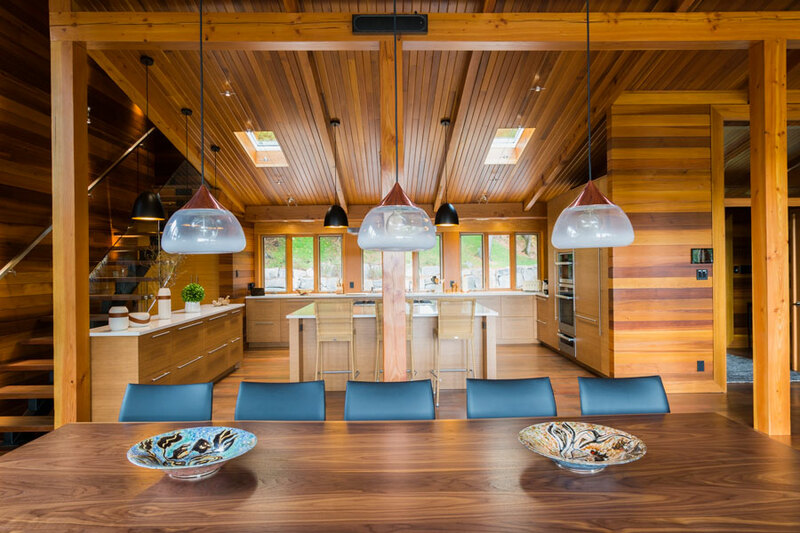 Light, quite literally, penetrates the home through the abundance of glass walls, but it also describes its graceful, airy and resolutely modern design. 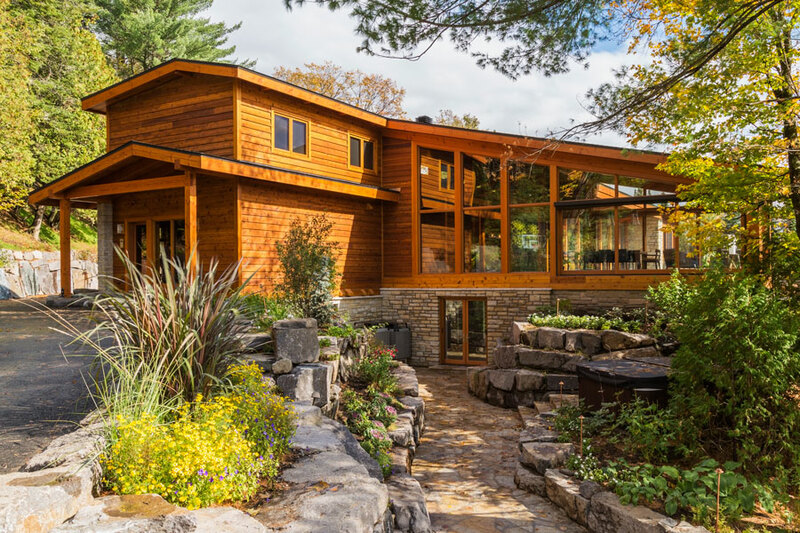 Though the architecture seems like it could take flight, the house remains anchored to the ground by the retaining natural stone walls surrounding it, and perfectly tying it to its natural landscape. This feat in rustic architecture wasn’t always so. When Mike and Marcia bought the property in 2005, the neglected pinewood-plank cabin that existed on this spot dated back to 1970, and it really showed its age. The couple coped with the cabin’s inefficiencies for 11 years before embarking on a major overhaul. However, the renovations they envisioned faced a few challenges. First, the couple was disappointed to learn that a substantial portion of the original house was in such disrepair, it had to be demolished. And the timetable was tight. The project, which got under way the day after Labor Day in 2016, had to be finished for Marcia’s birthday the following June. Fortunately, the demolition and reconstruction went smoothly, and the indoor work was completed during the winter months. Marcia, who had a definite idea of what she was looking for, was deeply involved with many aspects of the project. “I wanted a contemporary looking home with clean, uncluttered lines and open spaces, but that retained a sense of intimacy,” she says. The project progressed without a hitch, and by June 2017, Marcia celebrated her birthday in a house that’s a pure reflection of her personality. The architect who designed and oversaw the work, Andre Ibghy of Ibghy Architect Inc., a local Montreal firm, is a friend of the couple. From the initial meeting, he understood and translated exactly what Marcia and Mike desired into an architectural tour-de-force, and the result couldn’t make Marcia and Mike happier. Andre’s avant-garde design is organized around a grand central room where each space – kitchen, living and dining – is connected, yet separate. He also took full advantage of the site’s natural topography. Nearly all the rooms are oriented toward the spectacular view offered by the lake and surrounding mountains. Furthermore, he incorporated certain features, like floor-to-ceiling windows, that accentuate the feeling of being part of the great exterior landscape, so the couple and their guests can enjoy every season from the comfort of being indoors. 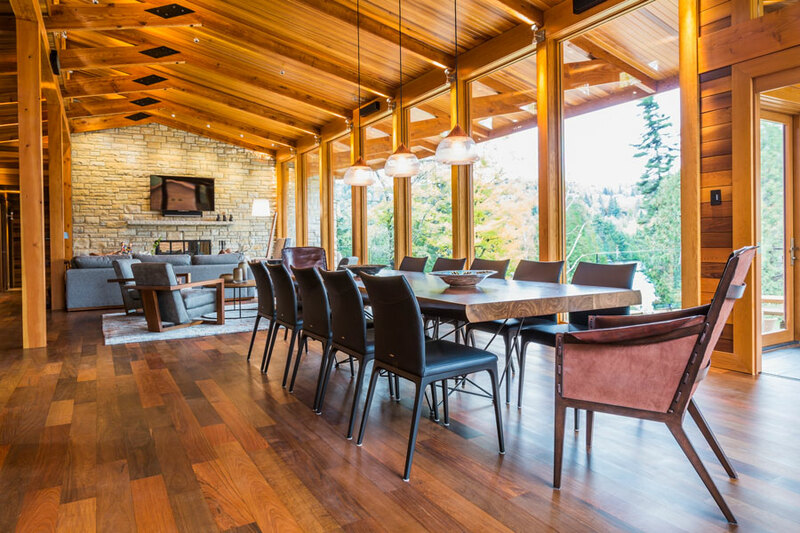 The home’s living space consists of 6,800 square feet spread over three levels. Besides the central room, it includes seven bedrooms, six bathrooms, a sauna room and an eye-catching gazebo. Projecting toward the lake, this gazebo is the perfect example of the indoor/outdoor feeling present throughout the house. It is a four-season space that can be a screened porch during the warm months and a glazed gazebo during cold temperatures. The slate-tile floor is equipped with radiant in-floor heating; the glass doors on both sides slide on parallel tracks; and screens can be lowered with the simple push of a button. If the gazebo offers the best vantage point of the outdoor scenery, the dining area is not lacking in beautiful vistas either. Glassed-in on two sides, it’s sparsely furnished with just the essentials. The Italian-made table seats 12, with a thick walnut top and a sculptural base. Not to detract from the structure’s exquisite architecture, Marcia favors a neutral palette and a casual-chic look. The living room at the opposite end of the central room boasts muted-gray colored fabrics and modern wood furniture, reflecting her well-defined interior concept. The fireplace is built into a natural stone wall that extends onto the outdoor terrace, anchoring the great room to the structure and its environment. 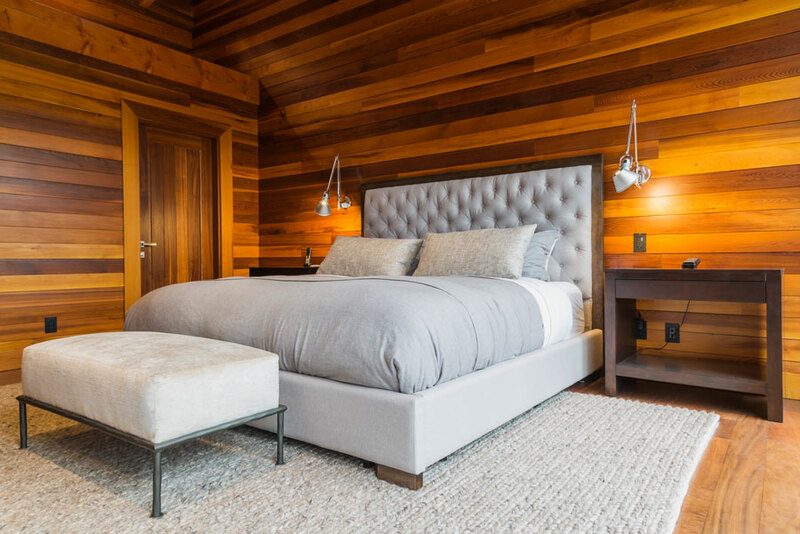 Wood, and lots of it, is an integral part of the overall design in this house and, for the insulated walls, Andre chose red cedar because of its rich grain and vibrant color. 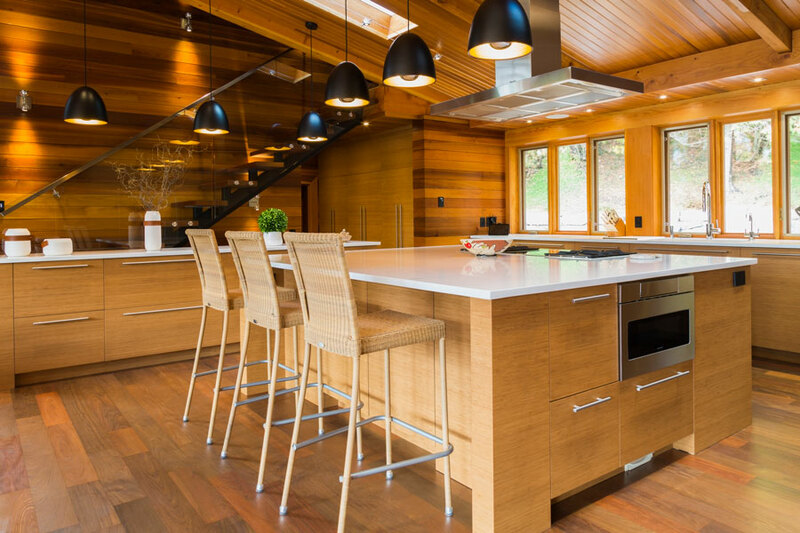 The structural timber elements, such as the posts and beams, are all fir imported from British Columbia. 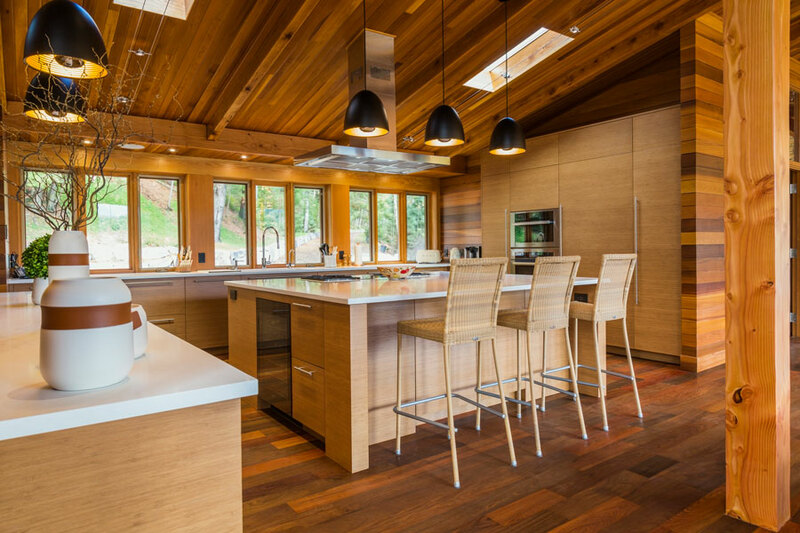 Left exposed and illuminated by spotlights that shine downward to highlight the texture of the wood, the timber framing defines the spaces within the home. 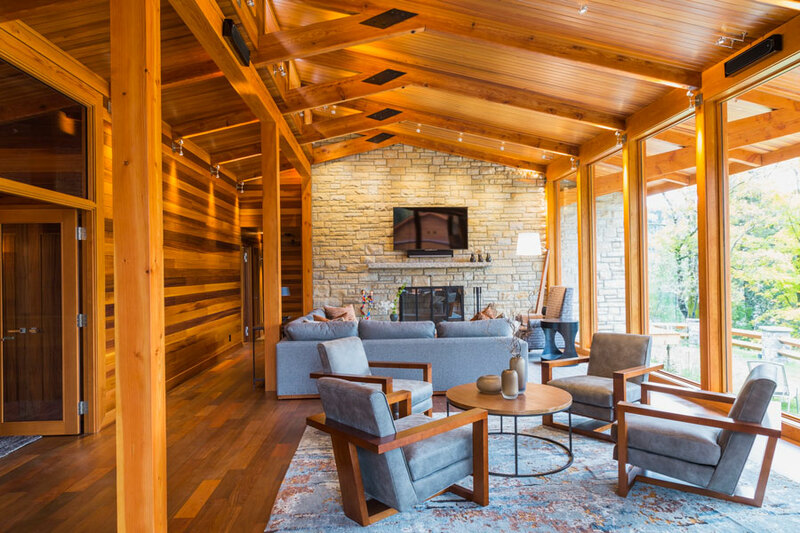 A honey-colored, translucent stain by Sikkens was used for both the exterior and interior cedar wood surfaces, including the timber elements. 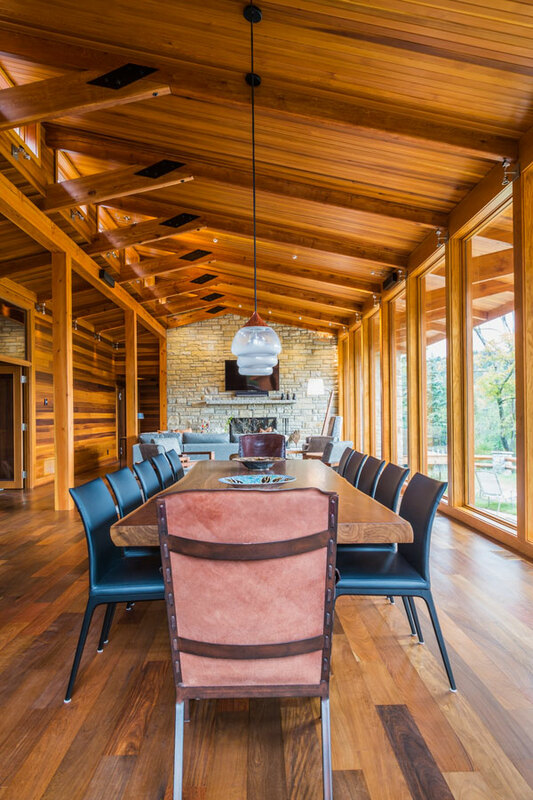 The floors are made of durable-yet-beautiful Ipe, an exotic wood often referred to as Brazilian walnut. Ipe is very resilient to foot traffic with beautiful mosaic-like color variations. On the far wall of the kitchen, the graceful staircase leading to the top floor looks like a sculpture. The large wooden steps are anchored to a central steel beam. 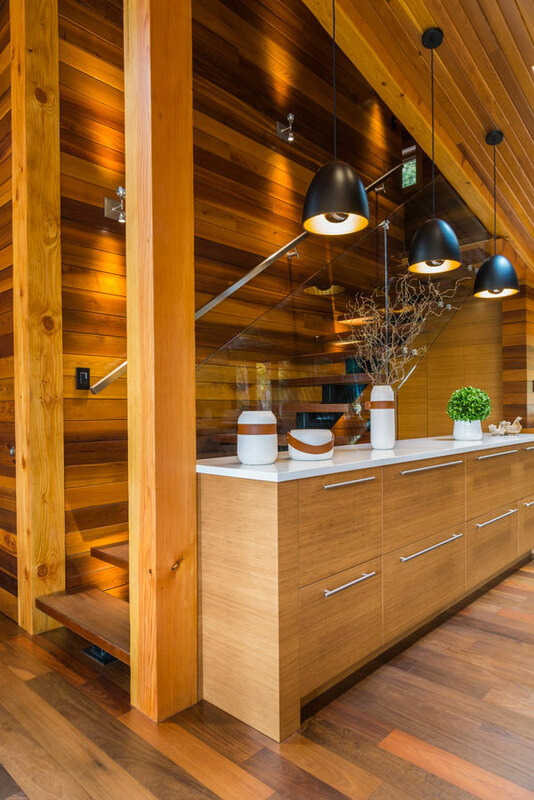 Andre’s keen sense of visualization on this project led him to choose tempered glass for the banister, which offers an uninterrupted line of sight onto the kitchen and dining areas. The master bedroom is on the main floor, tucked behind the stone fireplace. Here again, muted colors make the red cedar stand out. The bedding is all-natural fibers: linen, cotton and cashmere. The en suite is distinctive in that it doesn’t have a bathtub. 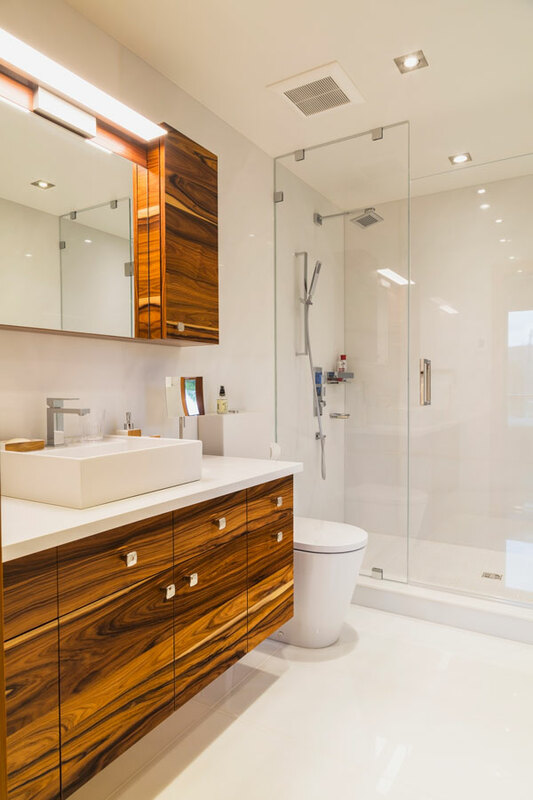 “I am more of a shower person,” explains Marcia, “so I wanted an oversized one with lots of elbow room.” Pure white marble covers the floor and walls, and exquisite rosewood was employed for the vanity cabinets. 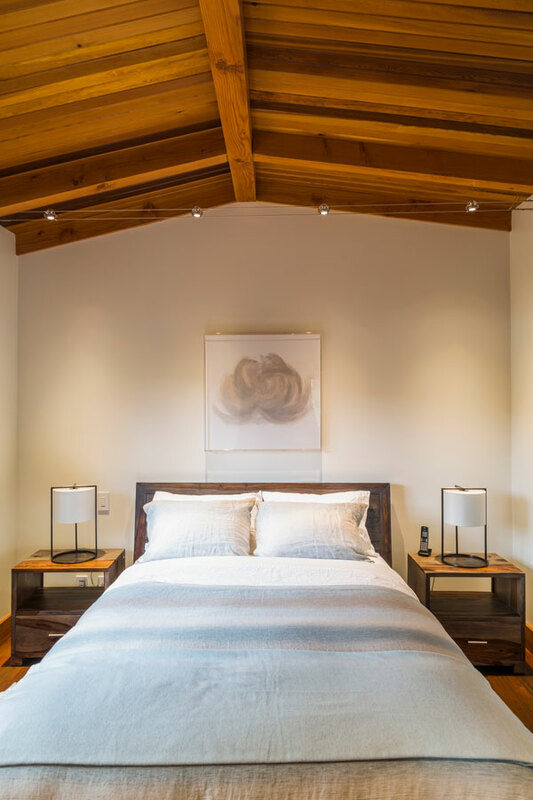 Throughout the house, the stone floors, whether slate or marble, are equipped with a radiant-heating system, as is the natural-stone walkway leading from the basement to the hot tub and pool. 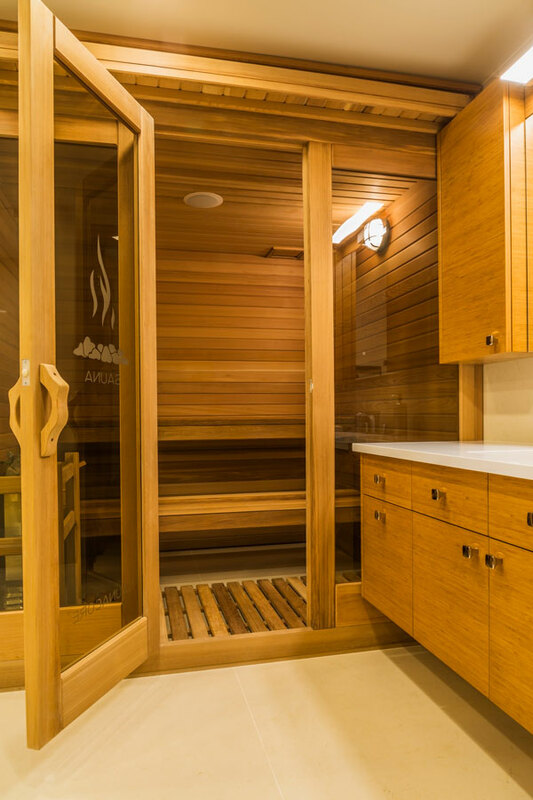 There’s also a sauna, salvaged from the old cabin, which is a very practical amenity when coming in from the pool or the hot tub outside. In this stunning residence, everything seems to have been designed for comfort, visual impact and leisure. It’s a tribute to the talent and knowhow of an architect with a vision, a woman with impeccable taste and a team of talented builders and craftsmen who artfully turn imagination into reality. Architect: Andre Ibghy / Ibghy Architect Inc.